Louis Aimé Augustin Le Prince (French: [lwi lə pʁɛ̃s]; 28 August 1841 – vanished 16 September 1890) was a French inventor who shot the first moving pictures on paper film using a single lens camera. He has been heralded as the "Father of Cinematography" since 1930. A Frenchman who also worked in the United Kingdom and the United States, Le Prince conducted his ground-breaking work in 1888 in the city of Leeds, West Yorkshire, England. In October 1888, Le Prince filmed moving picture sequences Roundhay Garden Scene and a Leeds Bridge street scene using his single-lens camera and Eastman's paper film. These were several years before the work of competing inventors such as William Friese-Greene, Auguste and Louis Lumière and Thomas Edison. He was never able to perform a planned public demonstration in the US because he mysteriously vanished from a train on 16 September 1890. His body and luggage were never found, but, over a century later, a police archive was found to contain a photograph of a drowned man who could have been him. Not long after Le Prince's disappearance, Thomas Edison tried to take credit for the invention. 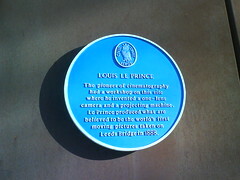 But Le Prince’s widow and son, Adolphe, were keen to advance his cause as the inventor of cinematography. In 1898 Adolphe appeared as a witness for the defence in a court case brought by Edison against the American Mutoscope Company. (The suit claimed that Edison was the first and sole inventor of cinematography, and thus entitled to royalties for the use of the process). Adolphe Le Prince was not allowed to present his father's two cameras as evidence (and so establish Le Prince’s prior claim as inventor) and eventually the court ruled in favour of Edison. However, a year later that ruling was overturned. Louis Le Prince. 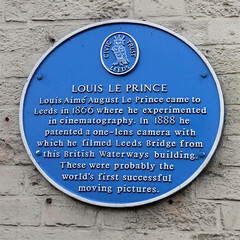 Louis Aime August Le Prince came to Leeds in 1866 where he experimented in cinematography. In 1888 he patented a one-lens camera with which he filmed Leeds Bridge from this British Waterways building. These were probably the world's first successful moving pictures.